J.K. Rowling: I’m here and I can’t wait! Bring on the questions! J.K. Rowling: The Ministry of Magic was de-corrupted, and with Kingsley at the helm the discrimination that was always latent there was eradicated. J.K. Rowling: Harry, Ron, Hermione, Ginny et al would of course play a significant part in the re-building of wizarding society through their future careers. Ryan Love: From your fans at thesnitch.Co.Uk. Weren’t we supposed to see ginny display powerful magical abilities in “deathly hallows” and find out why it’s significant that she’s the seventh child? Was her main role in the books only to be harry’s love interest? J.K. Rowling: important in the last book, though – are you sure I said that?! Renee: From reading about the original owners of the deathly hallows, the peverell brothers, i’m wondering if harry and voldermort are distantly related voldermorts grandfather ended up with the resurrection stone ring? J.K. Rowling: Yes, Harry and Voldemort are distantly related through the Peverells. J.K. Rowling: Of course, nearly all wizarding families are related if you trace them back through the centuries. As was made clear in ˜Deathly hallows’, Peverell blood would run through many wizarding families. J.K. Rowling: I loved writing it, and I loved the fact that Hermione took the initiative! J.K. Rowling: Ron had finally got SPEW and earned himself a snog! J.K. Rowling: ’ the human-presence-revealing spell Hermione makes use of in Deathly Hallows. J.K. Rowling: She’s still at Hogwarts, and she was one of the oncoming house-elves who attacked the Death Eaters in the final battle. Katieleigh: Does hermione still continue to do work with spew and is life any better for house elves! J.K. Rowling: where she was a progressive voice who ensured the eradication of oppressive, pro-pureblood laws. Tineke: Did teddy grow up living with his grandmother? J.K. Rowling: Yes, Teddy was raised by Andromeda. J.K. Rowling: Teddy had his godfather, Harry, and all his father’s friends in the Order, to visit and stay with. J.K. Rowling: Harry did so (just because Voldemort was gone, it didn’t mean that there would not be other Dark witches and wizards in the coming years). J.K. Rowling: Ron joined George at Weasleys’ Wizarding Wheezes, which became an enormous money-spinner..
J.K. Rowling: After a few years as a celebrated player for the Holyhead Harpies, Ginny retired to have her family and to become the Senior Quidditch correspondent at the Daily Prophet! Camille: What or who is peeves exactly, is he linked with the blood barons story? J.K. Rowling: Thank you! I’ve already answered about Hermione. Kingsley became permanent Minister for Magic, and naturally he wanted Harry to head up his new Auror department. J.K. Rowling: No, Peeves is not linked to the bloody Baron’s story. J.K. Rowling: He is a spirit of chaos that entered the building long ago and has proved impossible to eradicate! Alicepie: What happend to luna, did she get married who to? J.K. Rowling: She ended up marrying (rather later than Harry & co) a fellow naturalist and grandson of the great Newt Scamander (Rolf)! J.K. Rowling: I’m so sorry! I met a couple on launch night who had come dressed as Lupin and Tonks, and I felt dreadfully guilty as I signed their books! J.K. Rowling: Remus was killed by Dolohov and Tonks by Bellatrix. J.K. Rowling: It was deliberate. Snape had effectively abandoned his post before dying, so he had not merited inclusion in these august circles. J.K. Rowling: However, I like to think that Harry would be instrumental in ensuring that Snape’s portrait would appear there in due course. J.K. Rowling: As established by Ollivander, a wizard can use almost any wand, it is simply that a wand that chooses him/her will work best. Where there is a family connection, a wand will work a little better than a wand chosen at random, I think. J.K. Rowling: Yes, the new improved Percy ended up as a high-ranking official under Kingsley. J.K. Rowling: Yes, there is very definitely a link to the hat! J.K. Rowling: – the Sorting Hat was Gryffindor’s initially, as you know. J.K. Rowling: Griphook was wrong – Gryffindor did not ‘steal’ the sword, not unless you are a goblin fanatic and believe that all goblin-made objects really belong to the maker. J.K. Rowling: The Hufflepuff common room is accessed through a portrait near the kitchens, as I am sure you have deduced. J.K. Rowling: Sorry – I should say ‘painting’ rather than portrait, because it is a still-life. J.K. Rowling: It is a very cosy and welcoming place, as dissimilar as possible from Snape’s dungeon. Lots of yellow hangings, and fat armchairs, and little underground tunnels leading to the dormitories, all of which have perfectly round doors, like barrel tops. J.K. Rowling: Well, I don’t think that George would ever get over losing Fred, which makes me feel so sad. However, he names his first child and son Fred, and he goes on to have a very successful career, helped by good old Ron. J.K. Rowling: Hagrid has seen many deaths in quite a long life, so yes, he can see Thestrals. J.K. Rowling: He saw his family alive, whole and happy – Ariana, Percival and Kendra all returned to him, and Aberforth reconciled to him. Snapedinhalf: You promised that someone will do magic late in life in book 7. I’ve now read it three times but cant work out who it might have been! Please help!! J.K. Rowling: I’m sorry about this, but I changed my mind! J.K. Rowling: My very earliest plan for the story involved somebody managing to get to Hogwarts when they had never done magic before, but I had changed my mind by the time I’d written the third book. J.K. Rowling: Wormtail, desperate to curry favour, salvaged it from the place it had fallen and carried it to him. I admit that would have been a bit of a feat for a rat, but they are highly intelligent creatures! J.K. Rowling: They all became pretty much what I expected/planned them to become. J.K. Rowling: Of course they changed as I wrote, but nobody surprised me very much! J.K. Rowling: It was a symbolic way of showing that he came from a loveless union – but of course, everything would have changed if Merope had survived and raised him herself and loved him. J.K. Rowling: The enchantment under which Tom Riddle fathered Voldemort is important because it shows coercion, and there can’t be many more prejudicial ways to enter the world than as the result of such a union. J.K. Rowling: and, ultimately, laid down his life because of it. That’s pretty heroic! J.K. Rowling: Horcrux magic was not Voldemort’s own invention; as is established in the story, other wizards had done it, though never gone as far as to make six. J.K. Rowling: Voldemort dropped oblique hints; in his arrogance, he did not believe anybody would be clever enough to understand them. J.K. Rowling: (He does so in the graveyard of Little Hangleton, in front of Harry). He did this before Regulus and Regulus guessed, correctly, what it was that made Voldemort so convinced he could not die. J.K. Rowling: My temptation would be Harry’s, ie, the Stone. But I believe, as does Harry ultimately, that the greatest wisdom is in accepting that we must all die, and moving on. J.K. Rowling: the Ministry no longer used them to torment its opponents. J.K. Rowling: Colin wasn’t a student. He sneaked back with the rest of the DA, along with Fred, George and the rest. He ought not to have stayed behind when McGonagall told him to leave, but alas – he did. J.K. Rowling: No. Nor would I want him to. He’s happy where he is, and I’m happier without him! J.K. Rowling: Nothing deep and significant, I’m afraid. They’re just a comedy item. J.K. Rowling: The diary – Moaning Myrtle. The cup – Hepzibah Smith, the previous owner. The locket – a Muggle tramp. Nagini – Bertha Jorkins (Voldemort could use a wand once he regained a rudimentary body, as long as the victim was subdued). J.K. Rowling: The diadem – an Albanian peasant. The ring – Tom Riddle snr. J.K. Rowling: Because he knew that Ron might need a little more guidance than the other two. J.K. Rowling: Dumbledore understood Ron’s importance in the trio. He wasn’t the most skilled, or the most intelligent, but he held them together; his humour and his good heart were essential. J.K. Rowling: No, that’s what makes them frightening! J.K. Rowling: Slytherin has become diluted. It is no longer the pureblood bastion it once was. Nevertheless, its dark reputation lingers, hence Albus Potter’s fears. J.K. Rowling: Well, that is Snape’s tragedy. Given his time over again he would not have become a Death Eater, but like many insecure, vulnerable people (like Wormtail) he craved membership of something big and powerful, something impressive. J.K. Rowling: He wanted Lily and he wanted Mulciber too. He never really understood Lily’s aversion; he was so blinded by his attraction to the dark side he thought she would find him impressive if he became a real Death Eater. J.K. Rowling: As Dumbledore explains, the real master of Death accepts that he must die, and that there are much worse things in the world of the living. J.K. Rowling: It is not about striving for immortality, but about accepting mortality. J.K. Rowling: Harry is not, and never has been, a saint. Like Snape, he is flawed and mortal. J.K. Rowling: Harry’s faults are primarily anger and occasional arrogance. J.K. Rowling: On this occasion, he is very angry and acts accordingly. He is also in an extreme situation, and attempting to defend somebody very good against a violent and murderous opponent. J.K. Rowling: I’ve got a feeling he didn’t give it to any of them, but that James sneaked it out of his father’s desk one day. J.K. Rowling: I think that for one moment she trembled on the verge of wishing Harry luck; that she almost acknowledged that her loathing of his world, and of him, was born out of jealousy. J.K. Rowling: But she couldn’t do it; years of pretending that ‘normal’ was best had hardened her too much. J.K. Rowling: Oooo, you’re tough. J.K. Rowling: I must admit, I always wondered why nobody ever asked me what Dumbledore’s wand was made of! J.K. Rowling: And I couldn’t say that, even when asked ‘what do you wish you’d been asked…’ because it would have sign-posted just how significant that wand would become! J.K. Rowling: No, sorry… except to illustrate what an old bat she is. J.K. Rowling: You see Aberforth meeting Mundungus in Hogsmeade. That was the occasion on which Dung, who had taken Sirius’s mirror from Grimmauld Place, sold it to Aberforth. J.K. Rowling: Glad to see you like her as much as I do! J.K. Rowling: She was arrested, interrogated and imprisoned for crimes against Muggleborns. J.K. Rowling: We are having a heavily Dementor-influenced summer here in the UK. J.K. Rowling: Thank you for your thank you! J.K. Rowling: Yes, it was known that they were friendly and then stopped being friends. Nothing more than that would be widely known. J.K. Rowling: James always suspected Snape harboured deeper feelings for Lily, which was a factor in James’ behaviour to Snape. J.K. Rowling: Bless them, perhaps. But they’d need to replace the entire team and down several cauldrons of Felix Felicitas. J.K. Rowling: He was not prepared for the reality of life as a Death Eater. It was Voldemort’s attempted murder of Kreacher that really turned him. J.K. Rowling: Sorry, technical hitch – just answered a question before seeing it! J.K. Rowling: Not really. There would be a kind of rapprochement, in that Harry knows Draco hated being a Death Eater, and would not have killed Dumbledore; similarly, Draco would feel a grudging gratitude towards Harry for saving his life. J.K. Rowling: Real friendship would be out of the question, though. Too much had happened prior to the final battle. J.K. Rowling: Hmm. Good question. Poor eyesight? Did he look in the mirror and believe he was gorgeous as he was? J.K. Rowling: I think it more likely that he valued other qualities in himself! J.K. Rowling: Yes, at last! Incidentally, I know some have asked about Quirrell with regard to this question. J.K. Rowling: He was teaching at Hogwarts for more than a year, but NOT in the post of D.A.D.A. teacher. He was previously Muggle Studies professor. J.K. Rowling: Hm. I would advise a trip to Arkie Alderton’s Kwik-Repair Shop. Never attempt to mend a broom at home, the consequences can be disastrous. J.K. Rowling: Yes, I do. Through Harry’s account of Ron, and from reports of the professors who taught Ron, Dumbledore understood Ron better than Ron ever knew, and liked him, too. J.K. Rowling: No, the Patronus often mutates to take the image of the love of one’s life (because they so often become the ‘happy thought’ that generates a Patronus). J.K. Rowling: No, he is not a ghost. He is forced to exist in the stunted form we witnessed in King’s Cross. J.K. Rowling: They are two different charms. She has not wiped her parents’ memories (as she later does to Dolohov and Rowle); she has bewitched them to make them believe that they are different people. J.K. Rowling: The loss of Hedwig represented a loss of innocence and security. She has been almost like a cuddly toy to Harry at times. Voldemort killing her marked the end of childhood. I’m sorry… I know that death upset a LOT of people! J.K. Rowling: Snakes’ sense are very different from human ones. They can detect heat and movement in a way that we can’t. J.K. Rowling: The two other possibilities were ‘the Elder Wand’ (used instead as a chapter title) and ‘the Peverell Quest’, which I decided against quite quickly. I think the word ‘Quest’ is a bit corny! J.K. Rowling: I’d like an otter, like Hermione, but I’ve got a feeling it might be a large dog. J.K. Rowling: My pleasure, Finchburg! The Dark Mark would fade to a scar, not dissimilar to the lightning scar on Harry’s forehead. J.K. Rowling: Like Harry’s, these scars would no longer burn or hurt. J.K. Rowling: Thank you very much, Camille, and I’m sorry about Sirius. That man’s got a lot of fans. J.K. Rowling: Mostly female, I might add. J.K. Rowling: She’s dried out a bit now. J.K. Rowling: I’d like Harry’s wand – holly and phoenix feather. J.K. Rowling: Naturally. They would be like badges or medals of honour – proof that the owner had been at the heart of the fight against Voldemort from the start! I like to imagine Neville showing his to his admiring pupils. J.K. Rowling: I’m elated! It is great to be able to do this at last, I’ve looked forward to it for so long! 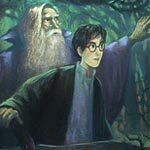 J.K. Rowling: Snape entered the house immediately after Dumbledore’s death, before Moody put up the spells against him. J.K. Rowling: To be honest, because it’s a cool shape. I couldn’t have my hero sport a doughnut-shaped scar. J.K. Rowling: what is really there. J.K. Rowling: We seem to have over-run. We’ve had over 120,000 questions, I’ve been told! J.K. Rowling: What can I say? Thank you so much for sticking with me, and with Harry, for so long. You have made this an incredible journey for Harry’s author. J.K. Rowling: I like this question, so I’ll take it for my last. J.K. Rowling: Surely ‘I did it my way’ by Frank Sinatra. J.K. Rowling: I’m very aware I haven’t answered everything… keep an eye on my website, and I’ll try and answer some more questions in due course! J.K. Rowling: That’s it… I’m Disapparating. Bye!